Click the button above. The first time you will register; after that, payments are an easy 3-step process. Click the button above and you can view the current amount you owe. A $1.00 fee is charged for checking/savings payments; 2.75% (+50¢ if payment is less than $100) is applied to credit/debit card payments. If you need assistance with paying online, call PSN at 866-917-7368. 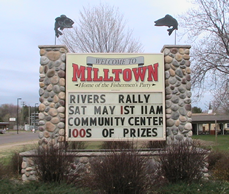 If you have questions on the amount of your bill or need service, call the Milltown Village office at 715-825-3258.